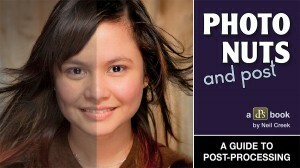 You are here: Home / Photography / Will “Photo Nuts and Post” Improve Your Images? I’m taking time out from the awful grind of processing several thousand of my own images for the web to review Neil Creek’s latest offering on photographic post-production. Let’s hope you think my words are worth your time reading them! 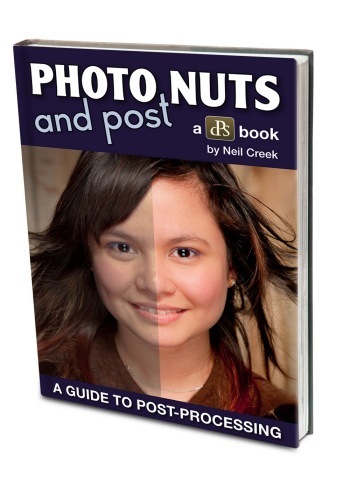 dPS’s new eBook – Photo Nuts and Post is the third instalment in the Photo Nuts series by professional photographer Neil Creek. Called "Photo Nuts and Post", this one is a follow-up to DPS staff writer Neil Creek‘s previous books "Photo Nuts and Bolts" and "Photo Nuts and Shots". According to the blurb on the sales page, "It tackles post processing head-on and gives you the tools and the courage you need to make it work for you". 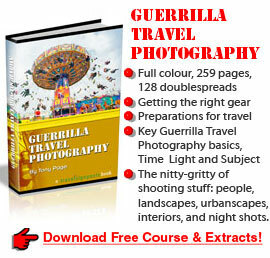 Photo Nuts and Post (yep, that’s an affiliate link, I get about US$8 if you buy the book, but I suggest you read my review first to find out whether you should). 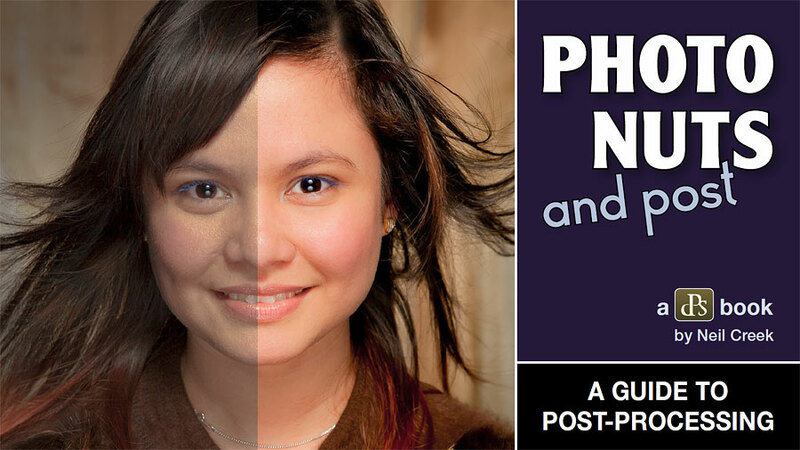 Photo Nuts and Post: (110 pages in all) covering a basic but pretty wide-ranging coverage of post-processing, including work flow and image storage. One hour of screencast videos which walk you through a number of the techniques talked about in the eBook. These videos are hosted on a password protected page on the DPS site (no download required). Note: I only got a review copy of the main Neil Creek eBook, so my comments only cover that, can’t tell you anything about the videos. So should YOU consider buying "Photo Nuts and Shots"? It’s certainly a realistic price at US$19.99 during the initial launch period (don’t know when this ends, but usually in around a fortnight). No word on any extra prize opportunities or anything at the moment, but I’ll let you know if anything is announced. You shouldn’t really pay much attention to that stuff, anyway, because the real question is whether it’s right for you – are you going to get anything out of it, is it worth you spending both your time and money on it? Well, my answer to that is, it depends (now where have you heard that before..?). If you’re a dead tree person (admission: I often am) and want to print it out, probably not, because it’s in a 16:9 widescreen format and doesn’t fit either A4 or letter size paper very well. Looks fine on screen though. But there are so many images that depend on proper colour rendition to make their point that this probably wouldn’t be a good idea in any event. Of course, the effectiveness of the before and after comparison images also depends on the accuracy of your screen’s colour calibration, but this factor is ignored in the book, see later. In an earlier review, I mentioned that I thought Neil’s strength is clearly in his landscape photography, and he has some excellent examples in this book too, but there are also plenty of people shots. As before, his book is really a personal statement of his own approach to photography, and none the worse for that. He intends it to be read along with the previous "Bolts" books and claims it teaches you "how to turn the photo you’ve captured into a finished, polished and appropriately prepared photo for whatever need you have, whether it be sharing online, printing or publishing in a book". This is a very ambitious statement, and frankly is simply not the case as regards traditional print publishing requirements, but read on. Does it fulfil its aims? Short answer: if you’re in its presumed target market, yes, but it has necessary limitations on the depth of information and techniques discussed because of the book’s length. On the other hand, some sections, like that dealing with work flow and storage, are quite detailed and really invaluable. If it’s right for you, I’ll give this a "yes" at its current price. Is this book suitable for you? Firstly, who is the target market and are you in it? I think it’s fair to say that most of the information contained in Neil’s book is suitable for the photographer who’s not dealing with the post-processing of a large number of images on an ongoing basis (e.g. a wedding photographer). If you’re in that category you should be looking up Guy Gowan (http://www.guygowan.com). But that’s OK, for as Neil says, he’s concerned with creating "a file suited for the intended use of the image. In the majority of cases, this is the creation of a JPEG file suitable for sharing online". So don’t look for detailed information on preparing a CMYK file for press production here, this book is mainly for someone who is looking to process his images one by one, with a probable intention of sharing or publishing online, either by email or in most cases via file-sharing/storage sites like Smugmug or the site that unfortunately trashes your images, Facebook. And that’s most of us, right? Here’s a shot of the contents page. 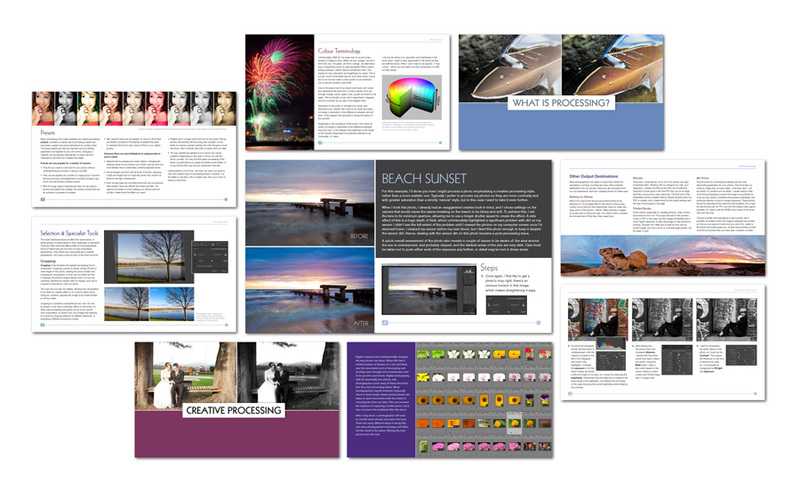 As you can see, Neil pretty much covers the ground you’d expect in a general post-production guide, with topics on file management and workflow, editing and processing tools, with first some general comments on the nature of image files and colour. He follows this up with some processing walkthroughs (apparently paralleled by the videos) showcasing some practical techniques. The section on common problems is OK on analysis but a bit light on solutions (frankly, you can’t fix everything) and Neil follows this up with an interesting section on "Creative Processing" which may stir a few feathers amongst the traditionalists. It’s 110 good-sized pages including the intro and ad at the end, but although there’s plenty of type the wide scope of Neil’s subject matter means that for the most part he can’t go into great detail on any particular topic. As I said about his earlier book, there’s a lot of text in this ebook, but this time I think it’s more clearly laid out and makes better use of sub-heads and other graphic devices (well done, Naomi!). I also think Neil’s writing style has improved, becoming more fluid and conversational. The way he injects more of himself into the narrative speaks of his growing confidence as an author, presumably buoyed by the success of his previous books. How about the photos? Effective use of Before and After pairings, as well as sequential process shots, are a great help in getting Neil’s points across, although he’s strongest in his landscapes. But this is essentially a practical book, and I’d say the use of images really adds to its accessibility. Also, you can’t forget the videos, which I presume take the form of screencast presentations (Camtasia or Screenflow type) taking you through actual (Lightroom) processing examples. 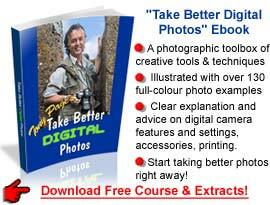 Software: Although Neil says that his advice is meant to be as software agnostic as possible, the fact is that if you use Lightroom or Photoshop you’ll get the most out of this book. To be honest, if you’re seriously interested in photographic post-processing you’ll need to be using one or both of these (you might get away with Photoshop Elements). Omissions: Neil fails to mention screen calibration as a factor in post-processing or the way your photos are likely to appear to someone viewing them on their own screen. If your screen is not calibrated then you can’t know whether any alterations you make will have the results you intend. That’s why all professional photographers go to great lengths to calibrate their screens, it’s step 101. Of course, the way a viewer of your photos has their screen set up and indeed, the lighting conditions under which they’re looking at them also has a major bearing on the way your images appear, but if your own screen isn’t calibrated to the accepted standard measurements you’re really giving yourself a handicap to start with. I’ve already mentioned CMYK press production, but there’s very little detail on the various sharpening techniques/options for output here either. I appreciate space limitations, but I don’t think Neil’s recommendation of simply leaving it up to your online storage service (presuming that you use one) to output an acceptable resized image cuts it, when you’re authoring a book claiming to "turn the photo you’ve captured into a finished, polished and appropriately prepared photo for whatever need you have". If you’ve read my comments above, you should already have a good idea whether this eBook is for you. If you’re an expert Photoshop maven, to be honest, you won’t find a lot new here, and I wouldn’t bother. If you’ve yet to get into processing your files after pushing the shutter release, or you have played about with it but feel you need to get a better understanding of the process, I think you’ll find this a useful buy. To quote the sales page: “If you’re intimidated by the idea of processing, don’t know how to make your photos look amazing like the pros, this is the resource to show you how to go from bland to brilliant.” Well, to be honest, that’s a bit of an advertising overstatement. But at US$19.99 and with the practical, wide-ranging scope of the topics covered it has to be a good buy as an introductory text. It’s probably worth it just for the section on workflow and how best to organize your images. As Neil says in his conclusion: ‘No matter your skill level, processing will make for better looking photos and make you a better photographer. If you haven’t processed your photos before, or struggle with the techniques, stick at it and you will soon see the results."